Above and below are views of the garden. This is what those who patronized Peter Pan in the 1960s and 70s remember. 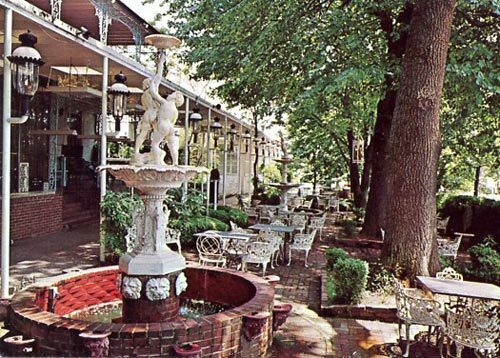 On a nice day, the chatter of outdoor diners would be mingled with splashing of water. 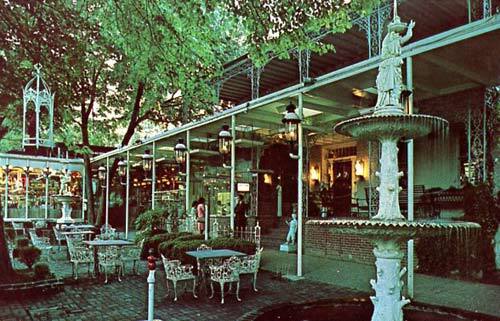 The long pergola was built to shelter diners waiting to order. The Peter Pan did not take reservations which is more cost effective for a restaurant. Customers waited, placed their orders for chicken, steak or seafood at the window (above, center) and then were seated. Note the statue hanging from the tree in both photos. At left in the top picture is the little gift shop. I can recall coming away from this with a packet of 100 postage stamps from around the world. Go to next panel.